Headaches are common…and annoying. Depending on several factors, the pain can be described as: dull, throbbing, pounding or sharp. It could be located on one or both sides of your temples, or your forehead, or the back of your scalp, or sometimes “all over”. How you get rid of the pain may depend on the causes for the headache. Sometimes, it could be related to missing a meal and becoming hypo-glycemic (low blood sugar) for a short period of time. Solution? Eat something! But…make it the “right” something! Choose wisely, click here for a list of high-quality, nutritious snacks or quick meals. Fast-food places even have some healthy options. Stress is another common cause of headaches. It could because you have a lot of homework, or a big test coming up. Maybe, you had an argument with someone at a school, or online…or maybe even a family member. Solution? Think back about the events of the day leading up to your headache. If related to schoolwork, try to get academic help from a BridgeUP fellow or tutor. Remember, the best way to tackle a big assignment or prepare for a test is to “Chunk”…break up the material into small pieces and tackle things one at a time. It helps to keep up with assignments and not try to cram everything in the night before a paper or project is due. If the stress was due to an argument or disagreement, take a moment to review the situation. Look at it not only from your point of view, but also put yourself in the other person’s shoes. Could there have been anything done to prevent or avoid the situation? What can be done to “nip the problem in the bud” to reduce the chances of things getting worse? Who can you talk to for advice about how to deal with the situation? Remember, in addition to family, BridgeUP and BeWell staff are always available to help talk. In the short run, use our TLYNTK tips in the box above. Lots of people talk about migraines. Migraines are specific types of headaches that sometimes associated with light or sound sensitivity, as well as nausea and vomiting. Before the pain comes, there may be warning signs…like temporary blurred vision or other changes in vision. Migraines may be caused by a variety of “trigger” factors like: chocolate, alcohol or….For a complete list of trigger factors, click . Solution? In the short run, people with migraines often feel better by lying down in a dark, quiet room. Sometimes, they need to take medication to reduce nausea. Regular pain relievers like aspirin, acetaminophen, ibuprofen or naproxen may help, but sometimes stronger, medicine prescribed by a health provider may be needed. In the long run, finding the trigger or triggers and avoiding them will help manage the situation. Sometimes, an infection can be the cause of a headache. Viral infections, like the flu, can make you feel tired, achy and uncomfortable all over, in addition to causing a headache. Also, when you have the flu, sneezing or coughing frequently can contribute to headaches. Usually the headache will pass once your body fights off the infection. However, be careful! If you have a high fever, severe sore throat, trouble swallowing, neck pain, nausea of vomiting, you may need to see your health provider or go to the emergency room to get checked out. 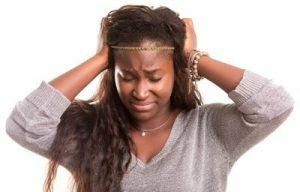 There are lots more causes of headaches, but the one thing everyone worries about is, could this be a brain tumor? 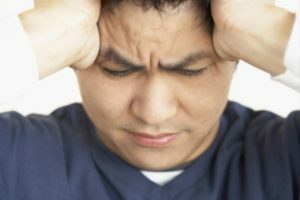 The discomfort with most headaches is relatively mild, even though it can be annoying, as we said before. The pain may come and go, and usually people feel fine in between headaches. However, with headaches associated with problems like brain tumors, the pain increases over time. Patients may have pain first thing in the morning, or the pain may wake them up at night. Sometimes, they may notice other signs, like: blurred vision, nausea, vomiting, or weakness on one side of the body. A general rule is, any pain that lasts more than a couple of days should get checked out by a health care provider.